The Administration for Children and Families (ACF) administers a broad range of formula and discretionary programs, including family self-sufficiency (Temporary Assistance for Needy Families), child support, child care, children and family services (Head Start, Child Welfare, Family Preservation and Support, and youth programs), and special programs for community development and for targeted populations, such as the developmentally disabled, refugees, and Native Americans. 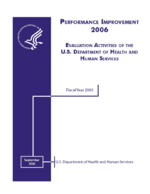 ACF’s evaluation objectives are to: furnish information on designing and operating effective programs; test new service delivery approaches capitalizing on the success of completed demonstrations; apply evaluation data to policy development, legislative planning, budget decisions, program management, and strategic planning and performance measures development; and disseminate findings of completed studies and promote application of results by state and local governments. ACF stays current on emerging issues affecting its programs and identifying questions for evaluation studies by actively engaging other federal agencies, state and local policy and program officials, national organizations, foundations, professional groups and practitioners, and consumers. Of primary concern are systems changes and how they affect vulnerable populations, particularly children. The movement toward devolving responsibility for health and human services to state and local organizations offers both tremendous opportunities and unprecedented challenges in redefining and implementing services for families. Studies are often funded as joint ventures with the Office of the Assistant Secretary for Planning and Evaluation (ASPE) and other federal agencies and foundations. Such collaborations permit large-scale efforts that are better informed and more representative of varying perspectives. Multidisciplinary experts review proposals. Evaluation study designs are carefully developed in collaboration with project partners and technical experts in order to address specific research questions. Work groups of various kinds are used to monitor the progress of projects and to advise on design refinements and the presentation of findings.